Low Output Impedance @ IL = 20mA, 40 Ohms Typ. The TC7662A is a pin-compatible upgrade to the Industry standard TC7660 charge pump voltage converter. It converts a +3V to +18V input to a corresponding –3V to –18V output using only two low-cost capacitors, eliminating inductors and their associated cost, size and EMI. In addition to a wider power supply input range (3V to 18V versus 1.5V to 10V for the TC7660), the TC7662A can source output currents as high as 40mA. The on-board oscillator operates at a nominal frequency of 12kHz. Operation be-low 10kHz (for lower supply current applications) is also possible by connecting an external capacitor from OSC to ground. 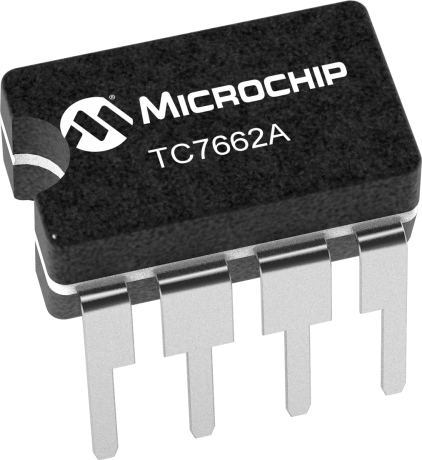 The TC7662A directly is recommended for designs requiring greater output current and/or lower input/output voltage drop. It is available in 8-pin PDIP, and CerDIP packages in commercial and extended temperature ranges.